The Frisco Sherpa Pet Blanket is ultra-soft to make your pet feel cozy anywhere they decide to curl up for a nap. This double-sided blanket is just as fashionable as it is snuggly. One side features a geometric twill pattern in soothing sky tones, and the other side offers a soft cloud Sherpa fabric with a neutral cream color. This modern pet blanket is great for pups and kitties, and it’s sure to become their new favorite napping buddy. The Frisco Sherpa Blanket goes along with any home décor, and not only does it protect your furniture from getting covered in fur, but it also gives pets their very own spot on the couch or bed. This cuddly blanket is perfect for chilly nights or pets who love to nest, and super easy to travel with. It’s machine washable, so it’s easy to keep clean and fresh for snoozing. Extremely cozy and soft, will make your pet feel warm and cozy no matter where they nap. Stylish design with a modern, geometric print in sky tones that will complement the décor of any home. Reversible and versatile blanket made with soft cloud Sherpa on one side and a printed twill pattern on the other. Perfect for protecting furniture from gathering fur, or for pets who love to bundle up and make a cozy nest. This blanket is machine washable for easy cleaning and care, even if your pet bundles up in it with dirty paws or wet fur. Machine wash separately in cold water only. If you have a top load washer, it’s best to wash in a mesh bag. Delicate cycle. Use only Non-Chlorine bleach when needed. Tumble dry in low heat. Reshape as needed. 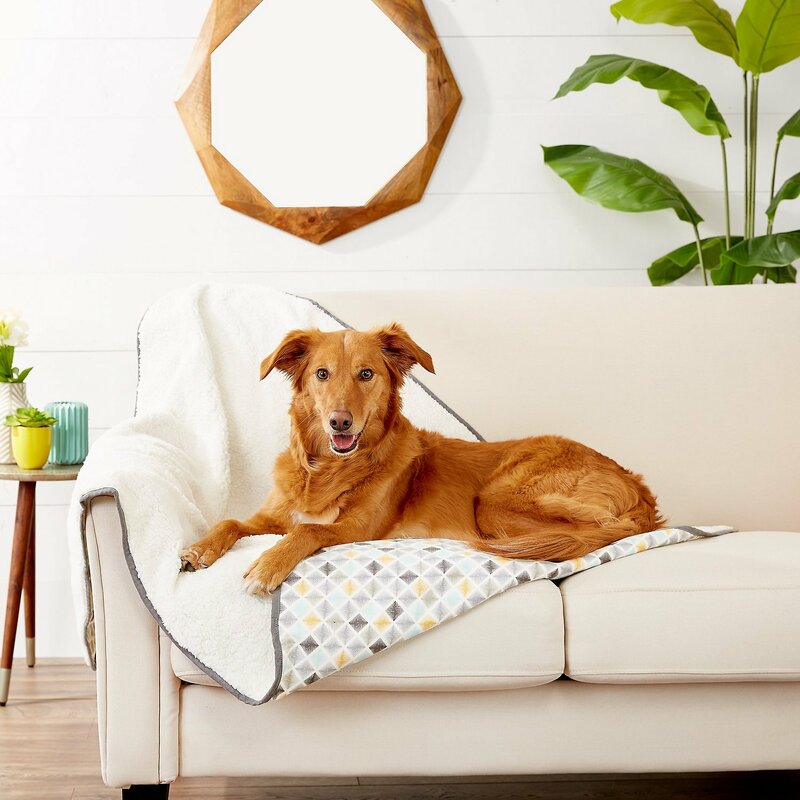 These pet beds offer the best of both worlds—luxuriously soft textures and snuggly shapes pets love, and trendy prints to complement your home décor. They come in a variety of styles and sizes to suit any pooch or kitty, from bolster beds to igloos and even orthopedic options for added support. Plus, they're easy to clean so whether messy or not, they're ready for all those snoozes and siestas! The Frisco Sherpa Cuddler, Frisco Sherpa Bolster and Frisco Deep Bolster beds have an ultra-soft, fluffy poly-fiber filling for the ultimate snuggling experience. These comfy beds provide easy entry for all ages with a slight dip in the front. The lavish cloud sherpa interior and deep sides make it the perfect nesting spot. For a touch of style, they come in a geometric twill print, basket weave print or gray chenille jacquard. For pets that need extra-comfy support, Frisco has orthopedic beds too. The Frisco Ortho Sherpa Cuddler & Cushion has a supportive egg-crate convoluted foam sleeping surface and a poly-fill cushion with ultra-cozy sherpa on one side. Give your pal a sofa of her own—the Frisco Ortho Front Bolster Sofa features a fluffy bolster and wrap-around gusset, super-comfy foam stuffing and easy-in slanted entry. Frisco's flat-surface beds are easy to hop onto, with a neat side handle for on the go. Let your pal sprawl out on the Frisco Tufted Lounger or doze on the Frisco Textured Plush Lounger with shredded foam, or curl up on the Frisco Sherpa Lounger with cozy cloud Sherpa. Plus, the Frisco Textured Plush Pillowtop Lounger provides a convoluted foam sleeping surface and a fluffy poly-fill pillow top for therapeutic-grade slumber. Chilly nights or daytime naps call for a cuddly blanket from Frisco. With fluffy cloud Sherpa on one side and a soft geometric or basket weave print twill on the other, this blanket offers both style and lounge-ability. It doubles as a chic throw blanket for the couch and your pet's very own spot on the furniture. The smart colors complement any home décor, and the trendy look of the basket weave print is totally Insta-worthy. Very soft, not overly thick, but exactly what I wanted to help cushion the inside of my girl’s kennel. Folded and placed underneath a pad, it did the trick. After I ordered the first one for the travel kennel, I ordered another for next winter to lay inside the kennel that I keep open indoor all year. I will use the reverse side for the warmer months. My Labrador cannot be trusted with a traditional "dog bed" or pad in his night-time crate. He destroys nearly everything put in with him. I discovered that he will not chew up a blanket though. YAY! No more "exploded" dog beds! This blanket size is generous enough to cover the entire bottom of his large crate. I wash it every week (3 months now) and it is still holding strong and looks no worse for the wear. Made of good, soft material, not stiff and scratchy. I feel I've gotten my moneys worth already! I use this as a sort of “top layer” blanket for inside my dog’s crate. I pile a lot of blankets in there to make her comfortable. With most blankets, I need to fold them a few times to make them cushion-y. This one: I can just fold once and it’s already super soft and plush for my dog! Since it’s winter, she loves this blanket, especially the sherpa side. I imagine the twill side will be nice and cool for the summer. I have purchased three of these blankets and my dog and I love them. In reading through the reviews some stated that one side was hard and the other soft which is true, however, that is perfect for a bed topper. The sizes are perfect according to need. My dog is 25 lbs, short, and long. The medium is perfect for her. The patterns are aesthetically pleasing and having three allows one side to cover bed and the other to snuggle. The third I use in my jeep. Last, having washed them regularly they have held up thus far. My pup loves this blanket! It’s so soft. I got the size small and it’s bigger than I expected. The price is worth it but, I honestly wouldn’t have minded paying a few more dollars for it. I recommend it. I’ll come and update my review later once I wash it to see how it holds up. We bought this blanket to use in our dog's stroller. It fits great with extra length to wrap up the side, giving our pooch a little privacy and something to snuggle into. It's nice and soft too. Really glad we picked this up. I purchased these items because of the look and price. Unfortunately the items are only stitched together around the edges. One trip through the washing machine and the 2 different fabrics shrank at different rates. This was a really nice surprise. 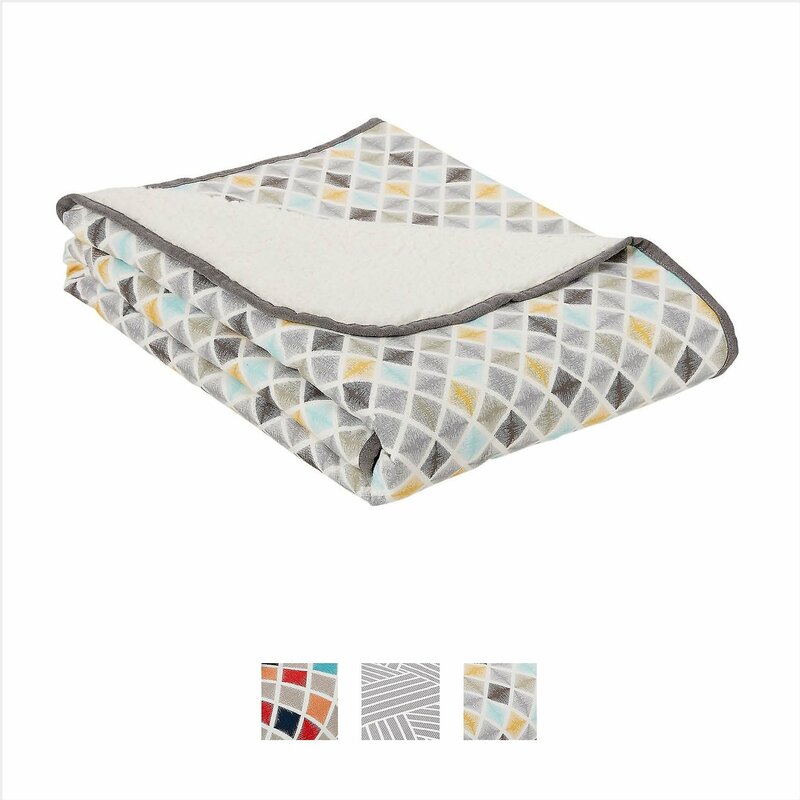 Much less expensive than other blankets I have purchased and I did not expect the quality blanket I received. I continue to like Frisco products.